Fun fact: I can fall asleep anywhere—on a plane, on a train, on a stack of (kid-sized) flour bags. I credit this particular gift to my growing up with parents who were franchisees of a popular coffee-and-doughnut chain—I spent a lot of time hanging, err, napping, in the back of stores. A couple of decades later, I’m still able to doze off without delay. That’s why I never gave my sleep pad, an ultra-soft and growingly lumpy Euro-top mattress nicknamed The Cloud Bed, much thought. For nearly five years, The Cloud Bed has provided me and my boo an idyllic dough-like surface for reading, watching horror movies, and snoozing in heavy doses. 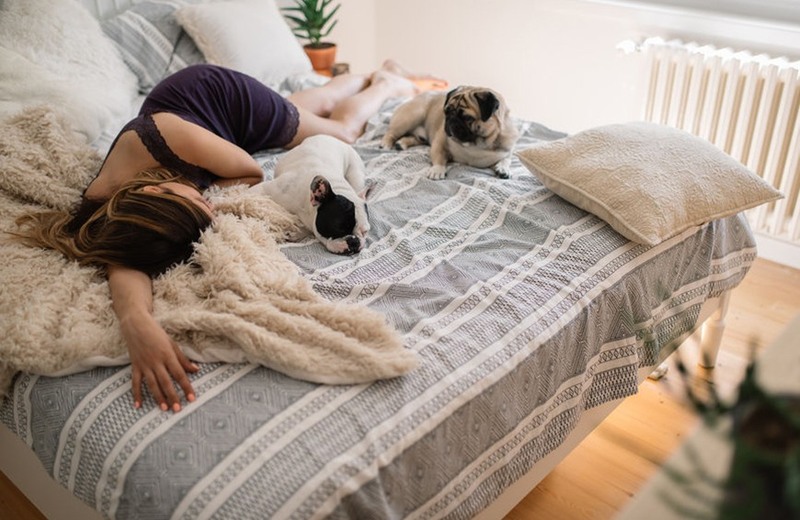 But when news reached my inbox that home-goods darling Parachute had plans to launch a top-of-the-line mattress (I’m talking $1,299–$2,199) after receiving thousands of customer requests for mattress recommendations, I knew I had to try it. That’s how I ended up swapping my trusty sack for an eco-friendly mattress, made to order in the U.S.—without adhesives or chemicals—to match my oft-washed linen sheets. As the just-delivered mattress unfurled on my bed frame, the first thing I noticed was the wool pom-poms garnishing the creamy, 100-percent cotton upholstery—a sign of a hand-tufted bed, according to Google. FYI: Tufts are the fabric threads skillfully inserted by hand into the foam-free mattress to hold its inner layers in place, helping maintain its uniform shape over many years of sleep. My first few nights of slumber and subsequent weekend Downton Abbey binge sessions were gloriously cozy. On a couple of workday mornings, I went into full denial mode that it was 7 a.m. and time to get out of bed. Made with 6,000 internal support coils and premium New Zealand wool that’s hypoallergenic and moisture-wicking (gotchu, night sweaters), my bed has never been more hibernation-inducing. Over the next two weeks, though, the perks of snoozing on a medium-firm mattress became apparent as my day-to-day back discomfort completely vanished. Turns out, my overly plush bed was causing the mystery flare-ups that I attributed to workouts or sleeping in a weird position. (Sound familiar?) Now that my back is better supported at night, I’m living twinge-free. Nailing that “just-right” firmness was the most time-consuming part of the two-year process for Parachute founder Ariel Kaye and her team. “Getting the perfect mix of softness and support was crucial for us,” Kaye says. “For the past six to eight months, we’ve product tested the mattress with members of the Parachute team, friends of the brand, investors, and partners to help us perfect this mix.” In the end, the internal coils are strategically placed throughout the mattress to offer firmer support in some areas including the center of the mattress, “providing more neutral alignment for the spine,” and softer zones for added comfort for your legs, shoulders, and head. Relishing two weeks of A+ sleep and comfy work days with no surprise pain have led me to an aha! moment: Sleeping on a subpar mattress is definitely something I’m leaving behind in my 20s—in the exact same pile as self-doubt, fast fashion, and friendships that no longer serve me. In this scenario, the Parachute Mattress is the friend who always shows up (even to 6 a.m. spin just because you asked) and accepts you for you—including your 10 p.m. bedtime and growing affinity for staying in. I now see my former bed that, ultimately, wasn’t right for me as the pal I clicked with immediately in an entirely different phase of life, who I’ve outgrown. It’s time for both of us to move on. Speaking of upgrading your sleep sanctuary, here are tried-and-true strategies to get your whites looking whiter than white with non-toxic bleach alternatives and weighted blankets designed to quell bedtime anxiety.